Kingsland, Texas is a Llano County community of about 6,000 situated at the confluence of the Colorado and Llano Rivers. In 1950, the Granite Shoals Dam was built in the area, forming Lake Granite Shoals. In 1965, the lake was re-named after the President of the United States, Lyndon B. Johnson. The lake has subsequently become known as "Lake LBJ." Today, the area is home to residents with luxury waterfront homes, retirees, vacation property owners. The discriminating Kingsland home buyer can select from among multi-million dollar waterfront properties and large, custom homes for sale in gated communities. At the same time, young families in search of nice starter homes for sale in Kingsland will not be disappointed by some of the value-priced real estate available in town. Kingsland real estate has become popular with retirees as well who like the combination of water-based activities, great golf, and proximity to the Austin. Martin King, Sr. and J. M. Trussell bought land here for a settlement in 1879. After King passed away, his widow named the community "Kingsville" in honor of her husband. In the 1880s, the town was home to a trading center and a cotton gin. In 1892, the tenor of the community life changed forever with the arrival of the Houston and Texas Central Railroad. Excursion trains departing from Austin brought city dwellers seeking the excellent hunting and fishing, picturesque scenery, and river activities. Because there already was a Kingsville in south Texas, the town's moniker was updated to Kingsland in 1901. In that year the Antlers Hotel, a Victorian-style structure, was built as a railroad resort. In 1907, this small but proeperous town had 750 residents. Then fire struck, and the population dropped as low as 150 in the 1920s. The community bounced back, and after falling into disrepair, so did the Antlers Hotel. The elegant Victorian facility was restored and re-opened in the 1990s. Owners of Kingsland TX real estate do not have to venture far from home for recreation. Wakeboarding, water skiing, windsurfing, and relaxing out on a pontoon boat are all popular pastimes on Lake LBJ. Marinas offer every kind of rental you'll ever need, from kayaks to pontoon boats. The Legends Golf Course rates 4 stars from TripAdvisor for its well kept greens and challenging design. 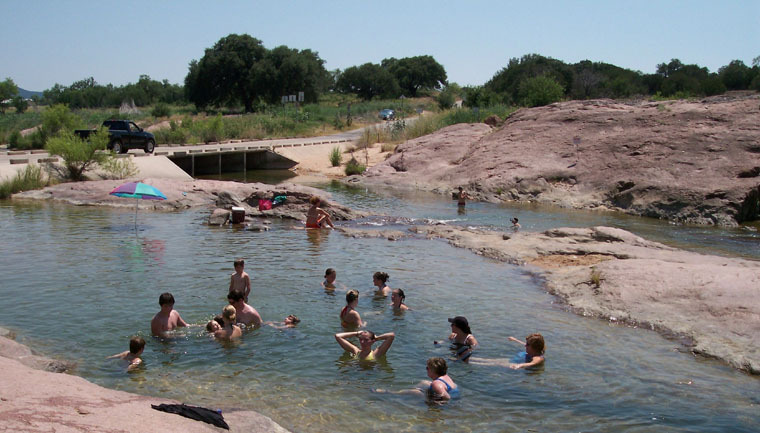 A unique destination in the area is "The Slab," a spot where the road crosses the Llano River as it flows over and around great granite slabs. Especially on warmer days, the local topography is perfect for swimming and wading where clear river waters flow over the granite. The granite outcroppings are a part of the rugged terrain comprising the "Llano Uplift," a geological anomaly resulting from an upward thrusting of the rock millions of years ago. Aqua Boom is a major Kingsland event that has been held for over forty years. This fourth-of-July event is a highlight of the summer in the community. A water parade complements the land parade. There's also a parade just for the kids. A ski show, live music, and celebratory fireworks add dimension to this grand festival. On a lighter note, the "Rubber Duckie" race and the "Wacky Raft" race bring out the youthful side of everyone involved. Call Josette Newberry and find your home in Kingsland. The upscale community of Kingsland offers Texas-style amenities and beautiful homes for families, vacation property seekers, retirees, and just about anyone. If Kingsland is your next destination, you should make the call to Josette Newberry at 512-632-2477. She is an experienced pro who knows Kingsland and the Lake LBJ real estate market. She has the deals, including waterfront and resort properties. She can help you find the home of your dreams in Kingsland, Texas!